NOTE: Click on image above to see e-mail that threatened "Potential Criminal Prosecution"
Still improving this thing. Hope to have it up to snuff soon. 9/17/2013 I received a few new things for this today from Linda McKinney of Space Coast Conservative. She sent along the list of people Maureen Rupe wanted on the PSJAB. 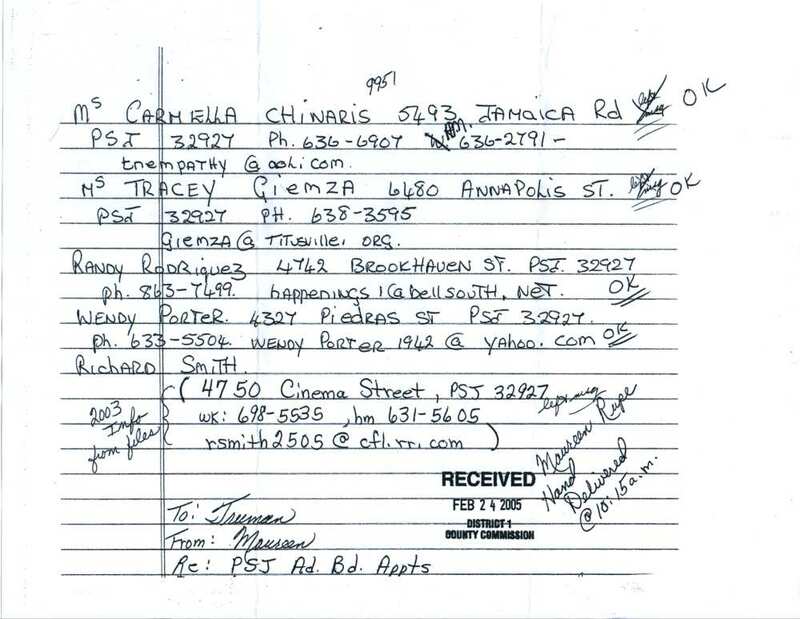 This list is the one that D1 refused to hand over after Ms McKinney's FOIA request for a list of people who had expressed an interest in serving on the Board. Ms McKinney says she requested the list only about 21 hours after Ms Rupe had hand delivered (see the not "Hand Delivered 10:15 a.m.") to D1's office. D1 refused to give it up, or provide a copy. 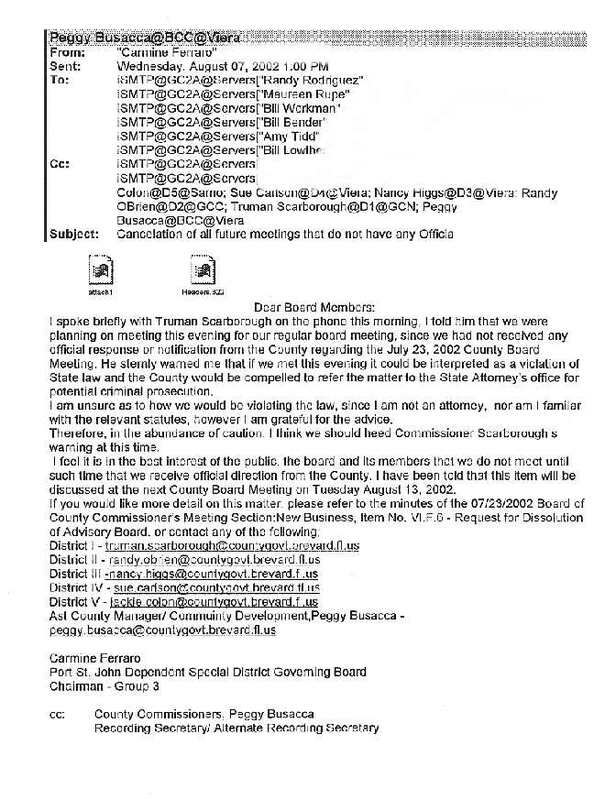 Even Scott Knox, the County Attorney, provided cover for D1's office (and, thus, to Ms Rupe) and interceded to prevent Ms McKinney from receiving the list. But Ms McKinney is nothing if not persistent and she succeeded in making them hand it over. Thus, it is here. 9/17/2013 Also, you may wish to glance at the Carmine Ferraro letter. He was part of the PSJAB (the one who sent out the "potential criminal prosecution" e-mail) and Ms McKinney says she had e-mailed him asking him for minutes of the PSJAB's meetings. You can read his reaction in this letter after she says she had confronted him on his noncompliance and lack of Sunshine Law adherance after a PSJAB meeting with representatives from the County Attorney's office present (Christine Lepore, Ms McKinney believes it was). Suffice it to say Mr. Ferraro was not happy. What astonishes me is how often the PSJ4T people react in the exact same ways: hostile, accusatory, defensive in the extreme, lying, hateful and vindictive. Does this tell you that a lot of leftists are cut from the same whole cloth? It seems so to me. This, ladies and gentlemen, is where the Port St. John Dependent Special District Advisory Board (PSJAB) began. On July 2, 1996 the BOCC met and voted to create the PSJAB. The PSJ HOA had been working on incorporation and the Community Overlay for at least two years already when the PSJAB was put into place. They "took it over" according to some of their published articles, but the two organizations worked simultaneously to bring about Port St. John, the City. Of course, there was the crossover portion that made that all possible. Those who were in charge of the PSJHOA were involved in the PSJAB and were in the group, Port St. John For Tomorrow, who supposedly spearheaded the incorporation push. I cover the PSJ4T in the PSJ Incorporation section. As they say, it was rather incestuous that the groups were so closely intertwined. The president of one group is vice president of another; a secretary of one is president of another. It was all very convenient for trying to push an agenda: incorporation. Below, the very skimpy minutes that were recorded for the Brevard County Board of County Commission meeting that they voted to creat the PSJDSDAB. Compare those to what is available today and it's a big difference. Seems so strange that so few words can be recorded for something that had such a big impact on the people of Port St. John and the surrounding communities. Chairman Cook called for the public hearing to consider an ordinance establishing a dependent special district for Port St. John area. Joseph Stadnick, Mary Tees, and Maureen Rupe expressed support for the ordinance. Linda McKinney, expressed objection to the ordinance. Discussion ensued on establishment of dependent special districts, public input, and sunset provisions. Motion by Commissioner Scarborough, seconded by Commissioner Higgs, to adopt Ordinance of the Board of County Commissioners of Brevard County, Florida creating a dependent special district to be known as the Port St. John Dependent Special District; providing for the purpose of the District; setting forth the powers, functions, and duties of the District; creating the methods for establishing and dissolving the District; providing a method for amending the Charter of the District; providing for the membership and organization of the Governing Board of the District; requiring compliance with applicable financial disclosure, noticing, and reporting requirements; establishing procedures for the conduct of the district elections and qualifications of electors of the District; setting forth methods for financing the District; setting forth geographic boundaries for the District; establishing authority for removal and budget approval; providing for severability; providing for an area embraced; and providing for an effective date. Commissioner Ellis stated he cannot support the ordinance the way it is; he sees the County going from an advisory board to a city council type of set up without being a city; and he is concerned this will lead to 10 or 12 pseudo cities set up for areas when their best option would be to incorporate, form a true city, and be independent. Commissioner O'Brien stated Commissioner Scarborough has made a very good attempt at helping a community within his District; he is asking the Board to cooperate; and he agrees with the suggestion on a sunset provision in the ordinance which could be every two years. Commissioner Scarborough amended the motion to include the sunset provision of every two years in the motion; and Commissioner Higgs accepted the amendment. Commissioner Ellis stated his concern on this is once the County starts these, it will never be able to go back; with Commissioner Higgs responding the Board has addressed it with the sunset provision. Discussion ensued on how the dependent special district should be set up. Commissioner O'Brien suggested the motion include that the sunset provision be under public hearing and not the consent agenda. Commissioner Scarborough stated he will incorporate that language in the motion; and Commissioner Higgs accepted the amendment. County Attorney Scott Knox recommended adding to Section 13, under effective date, a new sentence to read, "This ordinance shall stand repealed, effective July 1, 1998, unless extended after a public hearing held by the Board of County Commissioners of Brevard County prior to that date." CONTACT ME: Send me an e-mail.